This is one fish that didn’t get away. 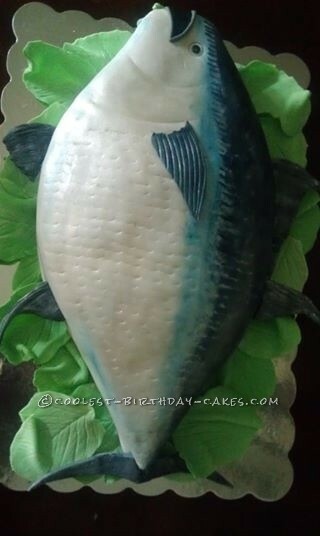 I baked a 9×11 cake cut in the shape of the fish. I used the scrap pieces of cakes to build up the belly of the fish. After covering fish in fondant I used a crisper to make it look like scales. I dusted the cake with different colors to give it a more realistic flare. Made the scales which took several attempts before getting it right attached with toothpicks. Placed lettuce leaves around the base. My friends said the restaurant staff wasn’t expecting a life like fish cake when they opened the box they couldn’t believe that it was a Blue Fin Tuna!